Before we start, a warning: this is probably not a fun night at the movies for your eight-year-old, unless said child is prematurely obsessed with flat-head screws. I mention this not out of a new-found commitment to providing consumer advice but because my friend Adam was frustrated by the apparent inability of movie reviewers to clarify this matter for him. Studio Ghibili’s long standing trust in the ability of children to stay interested in quiet moments and make sense of the senseless is admirable, but The Wind Rises seems to have been made in a different spirit from, say, Howl’s Moving Castle (which combined frantic scene-shifting with portraits of stark devastation to great effect) or Princess Mononoke (which grew slowly, steadily monstrous in front of the patient viewer). 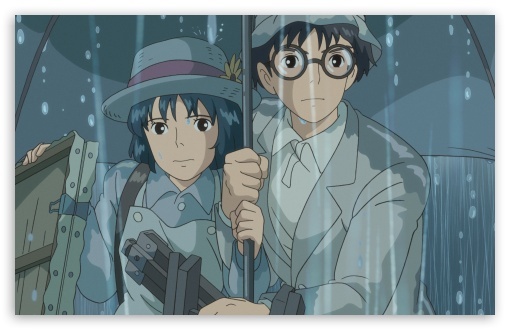 This film is realised with the lush, painterly attention to detail that characterises Hayao Miyazaki’s other movies, but this is definitely a film of and about our world. Its magic is not of the kind likely to intrigue a child into attentiveness: its wonders are the result of late night meetings as much as they are the product of dreams, and even its most hard won miracles taste of ashes. The most jarring note in this regard is the use of human voices to simulate the sounds made by everything from earthquakes to passing planes – it’s an initially childlike touch, but one that quickly takes on a more unsettling aspect, reinforcing as it does the fact that everything in this movie, from the beauty to the terror, is man made. I’ve seen few movies that know themselves as well as this one, and none that were confident enough to survive such awareness with such grace. 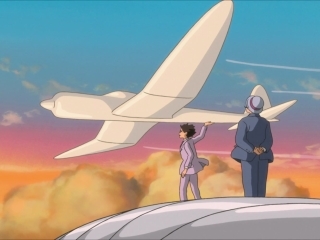 Like its protagonist, Jiro Horikoshi, inventor of the Zero plane, the movie is smart enough to understand its own tragic implications and honest enough about its commitment to beauty to continue regardless. 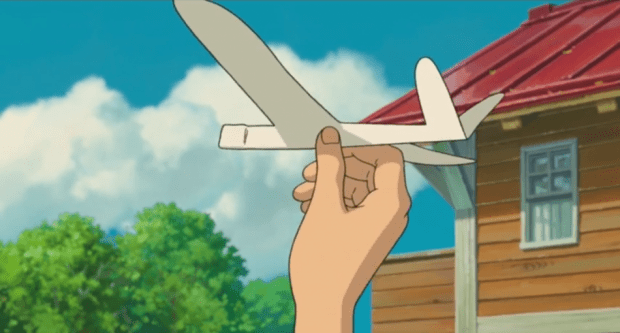 Everything that makes The Wind Rises uncomfortable is a result of this honesty. In his dreams Jiro is asked whether he would rather live in a world without pyramids or a world with one, given the human suffering involved in their creation. His frequently stated commitment to creating beautiful planes no more excuses his involvement in the creation of war machines than the film’s spare, pointed criticisms of Japan’s military ambitions help the viewer to swallow their qualms about this plot thread. Jiro pushes forward, gliding dreamlike above such mortal concerns, preternaturally attuned to the world – see his obsession with herring bones and their design implications – without every acting like he is truly part of it. This is made impossibly clear by the movie’s fictitious, Thomas Mann-referencing romance between Jiro and a tuberculosis ridden young woman. 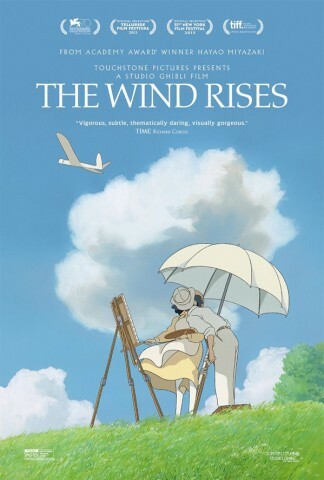 The scene where she lies on the floor, ragged with disease, unable to sleep, and he holds her hand while continuing to work on his designs with the other is The Wind Rises in microcosm: it’s not unconcerned about the suffering of others, but it won’t allow such worries to get in the way of its vision. This is not a particularly likeable movie, and its politely spoken, clever, and ambitious subject is not rendered particularly likeable in this telling either. If you’re anything like me you would probably have felt more at ease watching a movie that paid a little bit more lip service to its main character’s complicity in violence. One that spent more time not just acknowledging but discussing his flaws and suggesting alternatives. If you’re anything like me you’ll also be aware that all of this would leave the movie fundamentally unchanged. Everything that would have drawn me to that version of the movie exists in this one; its greatest strength is that it does not make this easy to live with. 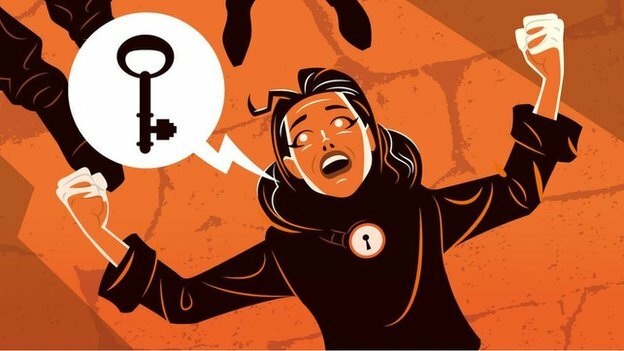 The interesting thing about the free, original comic that Rian Hughes and Grant Morrison created for the BBC’s freedom2014 season is that the very qualities that make it such an effortless, immediately accessible read are also the ones that leave it feeling quite trite in the end. The Key, then, is not a story about freedom but an advert for the idea of freedom. The BBC quoted this line on their website, and sitting on its own it carried the vague air of approval, so to be clear: in saying this, I meant that it had about as much to do with actual freedom as the famous 1984 Apple advert. All the craft on display here is put to the purpose of making sure one Key fits all readers, and while the counterargument would surely be that this smooth quality allows the reader to project their own meanings on top of this scenario I would argue that this immaculate surface would absorb all light that shines its way without giving much of anything back. And what use is a dystopian fiction if it doesn’t disturb, reflect or challenge our present reality in any meaningful way? CLICK HERE TO FIND OUT!